Heading into this season, I wondered out loud how Oakland GM Billy Beane manages to stay sane. He runs a front office that’s as informed, creative, and meticulous as any in North American sports, and his team is often among the best in baseball. Despite all of that, however, the A’s have never come close to making, let alone winning, a World Series during his tenure. And when we look back on the post-Moneyball A’s 50 or 100 years from now, that’s all we’ll care about, because when the championship team isn’t the best team, American sports culture still values the former over the latter. It’s a pretty powerful argument for nihilism. Of course, this year the A’s didn’t wait until the playoffs to leave the baseball world shaking its heads. A mere 10 months after being, by acclamation, the best team in baseball, Oakland sits at 20-33, 12 games behind the division-leading Astros, rubbing up against the bottom of the AL West standings and fighting for scraps, like a remora. 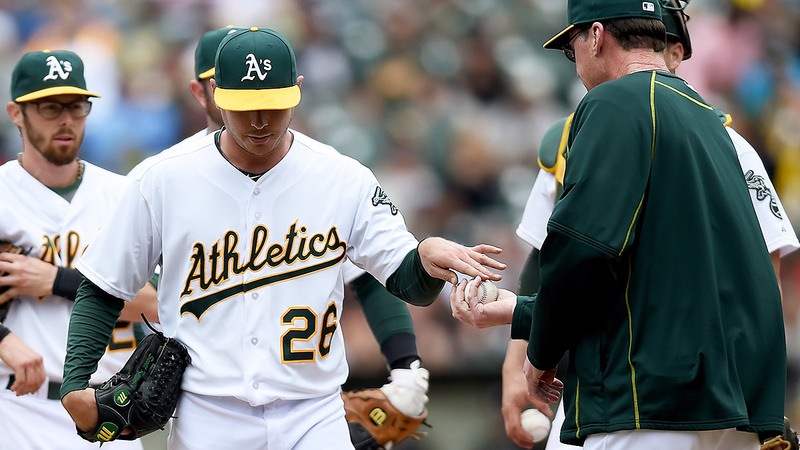 Last Wednesday, Scott Kazmir left his start with shoulder soreness. Earlier in May, Jarrod Parker’s attempted return from his second Tommy John surgery came to a halt when the bone that anchors the ligament to his elbow gave way during a rehab start. These injuries are partly the result of Oakland leaning heavily on pitchers with medical questions, and though that strategy has worked well in the recent past, in the context of a season like this, these setbacks almost look like the physical symptoms of demonic possession. So what happened? Occam’s razor says the A’s are bad because of deadline moves they made to go all in a season ago, followed by the offseason moves they made to back rapidly away from that position after the whole enterprise went to pot in the playoffs. I don’t think it’s particularly controversial to say the A’s would be much better right now if they’d re-signed deadline acquisitions Jason Hammel and Jon Lester. Or if they hadn’t traded Josh Donaldson to the Blue Jays this offseason. Or — and here’s the kicker — if they’d just kept top prospect Addison Russell, who can actually play shortstop, instead of trading him to the Cubs for Jeff Samardzija last season, then flipping Samardzija to the White Sox this offseason for a package headlined by Marcus Semien, who’s committed 18 errors in 53 games. Some of those trades are bad. For instance, I don’t think the first Samardzija trade was defensible at any point in time, and it only looks worse in the context of the second. But that’s not the whole story. You see, Semien’s glove might actually have a curse on it. Oakland might actually be under some sort of supernatural influence, because the truth is, this team’s really not that bad. Oakland’s been pretty much average offensively and defensively, ranking 15th in team OPS and fifth in opponent OPS, which isn’t as good as it looks given where the A’s play, but is still pretty good. Meanwhile, we’re at a point in the season when run differentials are almost as volatile as win-loss records, so any comparison to Oakland’s 27-26 Pythagorean record is subject to the whims of one or two blowouts, and the A’s do have a winning record in games decided by five runs or more. So when I say that until just taking three of four from the Yankees they’d underperformed their run differential by seven games in two months, take that with a grain of salt. That said: Seven games in two months is an outrageous disparity. It’s worse than realistic, so preposterous that it almost seems unjust. Absolutely unsustainable. Bob Melvin is sitting in his uniform in a doctor’s office. He’s undergone one of the worst two-month stretches of his career and is starting to feel run down. He’s had his team X-rayed and is waiting for the results. “Thirteen games under .500,” Melvin murmurs with a cough. “Well, I’ve got something to show you,” the doctor says. He stands and walks over to a light box, motioning for Melvin to follow him. The doctor withdraws an image from a folder and hangs it up. THREE AND FIFTEEN IN ONE-RUN GAMES. I don’t have an adjective for that, or an explanation. Being without closer Sean Doolittle hasn’t helped, but not all teams go 3-15 in one-run games when relying on a backup closer. That’s the kind of record a squad puts up if Queen Mab cultivates a homunculus and tasks it with following the team around and undermining everything it does. The only other team within three games of being that bad in one-run games — and frankly, I’m shocked there’s even one team — is the Blue Jays, who are also underperforming their run differential by five games and have a bullpen made up of guys who unsuccessfully auditioned for the role of Bodhi in the Point Break remake. Even that supposedly sad sack Semien, who’s being pilloried for his poor defense, has actually been an enormous asset as the third-best position player on the team in terms of bWAR. Semien is hitting .283/.326/.444, and shortstops who can do that in a pitchers’ park don’t exactly grow on trees. And while 18 errors in 53 games looks bad, let’s not forget that we have much better ways to judge defense. DRS says Semien’s been more or less average, and Baseball Prospectus’s FRAA grades him at minus-0.7, which is still not very good, but is also not fatal; Semien is 13th in FRAA out of 22 shortstops who have had 150 plate appearances or more. Are 50 games’ worth of advanced defensive statistics gospel? No. But I trust what little they reveal more than I trust errors saying to break out the sackcloth and ashes. Of course, the hilarious thing about all of this is that the underlying stats don’t matter, no matter how exculpatory they are to Beane, or Melvin, or any player or group of players. It doesn’t matter whether Oakland’s record through 53 games is fair or reflective of reality. That record is written in stone, and starting out 13 games under .500 is a body blow. It’s like starting a marathon 20 minutes late and with your shoes tied together. You don’t come back from that. And so we’re back to where we were over the winter — with results not accurately reflecting performance, for reasons that are either unclear, uncontrollable, or both. Nobody cares that the A’s aren’t as bad as their record would suggest, because it doesn’t really matter. In fact, the only useful thing we’ve learned from the first two months of Oakland’s season is that nothing it does matters. And looking back on the past two decades of A’s baseball, it’s hard to see how anything matters at all.